May 12th. We are pleased to have the Snapes back at the club. We are pleased to have the Snapes back at the club. There is no one quite like them , being equally at home with traditional material or songs from the music hall and variety days. 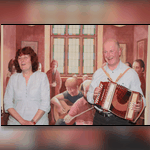 Barbara’s lovely clear voice and Peter’s sensitive melodeon are a joy to the ear. The material is delivered with a light touch that belies a professional and well honed performance. Come early they are very popular.